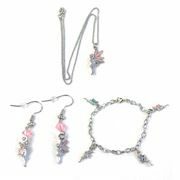 Our Fairy Jewellery is perfect for fairy believers! 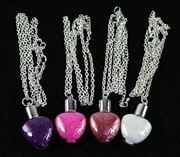 Fairy Dust & Fairygoodies branded charm necklaces, bracelets and earrings in a range of colours. Each piece of jewellery is made from bright zinc coated steel and is hypoallergenic. All products are sized for children although most can also be worn by adults. All products come packaged, mostly on colour backing cards in cellophane envelopes. 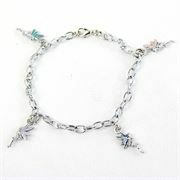 Our fairy bracelets and necklaces have quality spring clasps to prevent loss. Our fairy jewellery is available wholesale to independent retailers in the UK and Europe. If you are a retailer interested in stocking wholesale fairy jewellery, please register your business using the button at the top right of the page and we'll send you further details on our wholesale fairy range.